Australian rugby player Israel Folau faced widespread backlash for posting anti-gay messages on social media. 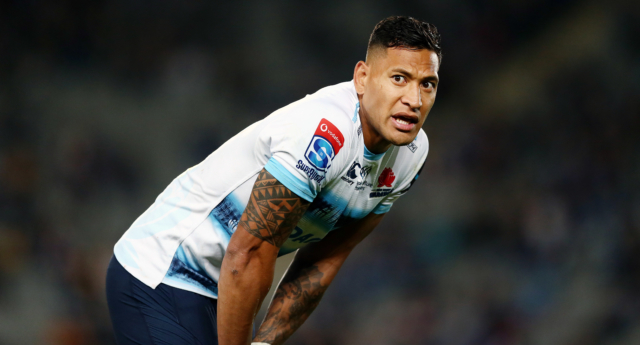 Rugby Australia, Folau’s team Wallabies main sponsor Qantas Airways, and even New Zealand Prime Minister Jacinda Ardern are among the figures and organisations who strongly condemned Folau’s views on Thursday (April 11). The messages, posted on Instagram and Twitter, were posted hours after Tasmania passed sweeping reforms to permit people 16 or older to change their registered gender, removing requirements for transgender people to undergo surgery in order to have their legal gender recognised. Folau’s posts were ‘liked’ by a number of fellow rugby players, such as fellow Wallabies teammates Samu Kerevi and Allan Alaalatoa and All Blacks flanker Vaea Fifita, as The Sydney Morning Herald and Newshub reported. Other rugby players instead participated in the backlash to Folau’s posts. Rugby Australia is now investigating Folau for his “unacceptable” comments, putting the player’s participation in further sporting events up for discussion just months ahead of the Rugby World Cup starting in September. Kiwi Prime Minister Ardern was also asked to comment on Folau, who is married to New Zealand netball player Maria Folau. “Obviously on a personal I clearly don’t agree with what he said. I am very mindful of the fact that for many, he is a role model. He is a person in a position of influence and I think with that comes responsibility,” she said on Thursday, quoted in Newshub. However, just months later in April 2018, he prompted outrage by saying gay people were going to hell “unless they repent of their sins.” His latest anti-LGBT+ posts were posted exactly a year since meeting with Rugby Australia CEO Raelene Castle and NSW Rugby counterpart Andrew Hore to discuss his social media use.